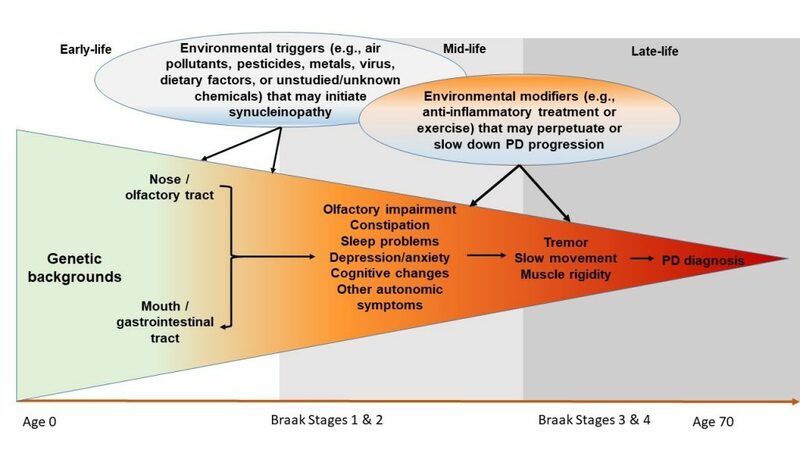 Amsterdam, NL – Environmental factors are widely believed to play a key role in the development of Parkinson's disease (PD), but little is known about specific environmental triggers. Writing in a supplement to the Journal of Parkinson's Disease, scientists review novel research hypotheses and approaches that may help better define the role of environment in the development of PD, especially before a diagnosis can be made based on the characteristic motor dysfunction for which PD is known. Full open access study: “The Search for Environmental Causes of Parkinson’s Disease: Moving Forward,” by Honglei Chen, MD, PhD, and Beate Ritz, MD, PhD (DOI: 10.3233/JPD-181493) published in the Journal of Parkinson’s Disease, Volume 8, Supplement 1 by IOS Press. It is openly available at content.iospress.com/articles/journal-of-parkinsons-disease/jpd181493. For additional information contact Diana Murray, IOS Press (+1 718-640-5678 or d.murray@iospress.com). Journalists wishing to interview the study’s authors should contact Honglei Chen (chenho@epi.msu.edu) or Beate Ritz at (britz@ucla.edu). The Journal of Parkinson’s Disease published a special issue in 2017 to commemorate the 200th anniversary of James Parkinson’s “Essay on the Shaking Palsy,” and we highlighted eight of the most important advances in Parkinson’s research over the past 60 years. As we were working on that special issue, we commented on how the pace of Parkinson’s research has accelerated remarkably. We speculated that there would be more advances in the treatment and care of Parkinson’s disease during the coming 20 years than were evident during the preceding 200 years. Thus, the idea of a collection of short, forward-looking, and visionary articles was born. Eventually, we identified 19 topics for articles, and we are very excited about the outcome. In 1964 Bob Dylan sang “The Times They Are a-Changin’;” this special supplement clearly shows that the field of Parkinson’s is no exception. This new special issue, published as a supplement, is openly available at content.iospress.com/journals/journal-of-parkinsons-disease/8/s1 or via the short link tiny.cc/JPD20.